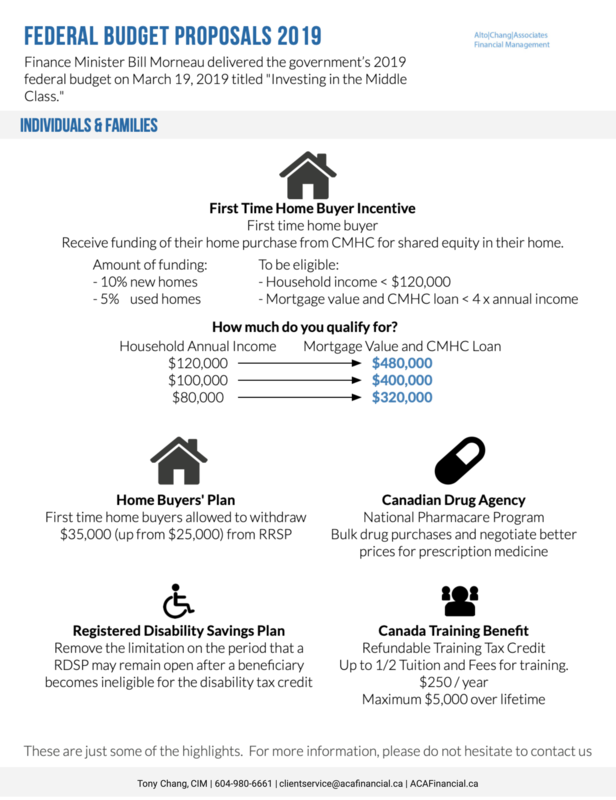 Currently, the Home Buyers’ Plan allows first time home buyers to withdraw $25,000 from their Registered Retirement Savings Plan (RRSP), the budget proposes an increase this to $35,000. The Incentive is to provide eligible first-time home buyers with shared equity funding of 5% or 10% of their home purchase price through Canada Mortgage and Housing Corporation (CMHC). Household income is less than $120,000. There is a cap of no more than 4 times the applicant’s annual income where the mortgage value plus the CMHC loan doesn’t exceed $480,000. The buyer must pay back CMHC when the property is sold, however details about the dollar amount payable is unclear. There will be further details released later this year. A refundable training tax credit to provide up to half eligible tuition and fees associated with training. Eligible individuals will accumulate $250 per year in a notional account to a maximum of $5,000 over a lifetime. The budget proposes to remove the limitation on the period that a RDSP may remain open after a beneficiary becomes ineligible for the disability tax credit. (DTC) and the requirement for medical certification for the DTC in the future in order for the plan to remain open. This is a positive change for individuals in the disability community and the proposed measures will apply after 2020. The government will continue consultations with farmers, fishes and other business owners throughout 2019 to develop new proposals to facilitate the intergenerational transfers of businesses. The introduction of a $200,000 annual cap on employee stock option grants (based on Fair market value) that may receive preferential tax treatment for employees of “large, long-established, mature firms.” More details will be released before this summer. For certain registered plans, two new types of annuities will be introduced to address longevity risk and providing flexibility: Advanced Life Deferred Annuity and Variable Payment Life Annuity. This will allow retirees to keep more savings tax-free until later in retirement. Advanced Life Deferred Annuity (ALDA): An annuity whose commencement can be deferred until age 85. It limits the amount that would be subject to the RRIF minimum, and it also pushes off the time period to just short of age 85. 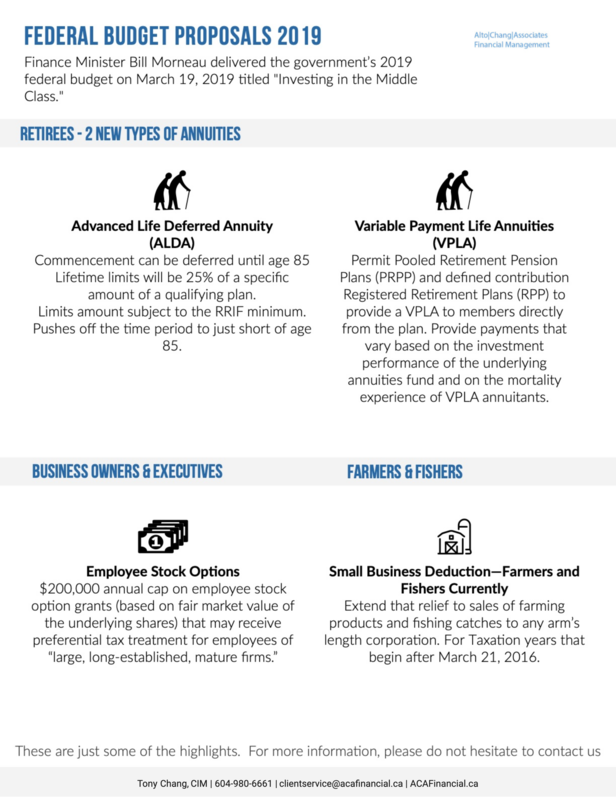 Variable Payment Life Annuity (VPLA): Permit Pooled Retirement Pension Plans (PRPP) and defined contribution Registered Retirement Plans (RPP) to provide a VPLA to members directly from the plan. A VPLA will provide payments that vary based on the investment performance of the underlying annuities fund and on the mortality experience of VPLA annuitants. Farming/Fishing will be entitled to claim a small business deduction on income from sales to any arm’s length purchaser. Producers will be able to market their grain and livestock to the purchaser that makes the most business sense without worrying about potential income tax issues. This measure will apply retroactive to any taxation years that began after March 21, 2016. To learn how the budget affects you, please don’t hesitate to contact us. Below, we have listed some of the key areas to consider and provided you with some useful tips to make sure that you cover all of the essentials. In order to receive the Canada Child Benefit in 2019/20, you need to file your tax returns for 2018 because the benefit is calculated using the family income from the previous year. Eligibility depends on set criteria such as your family’s income and the number and age of your children and you may qualify for full or partial amount. The CRA offers a low interest rate on loans and it therefore makes sense to consider setting up an income splitting loan arrangements with members of your family, whereby you can potentially lock in the family loan at a low interest rate of 2% and subsequently invest the borrowed monies into a higher return investment and benefit from the lower tax status of your family member. Don’t forget to adhere to the new Tax on Split Income rules. Have you sold your main residence this year? If so, your 2018 personal tax return must include information regarding the sale or you may lose any “principal residence” exemptions on the capital gains from the sale and thus make the sale taxable. 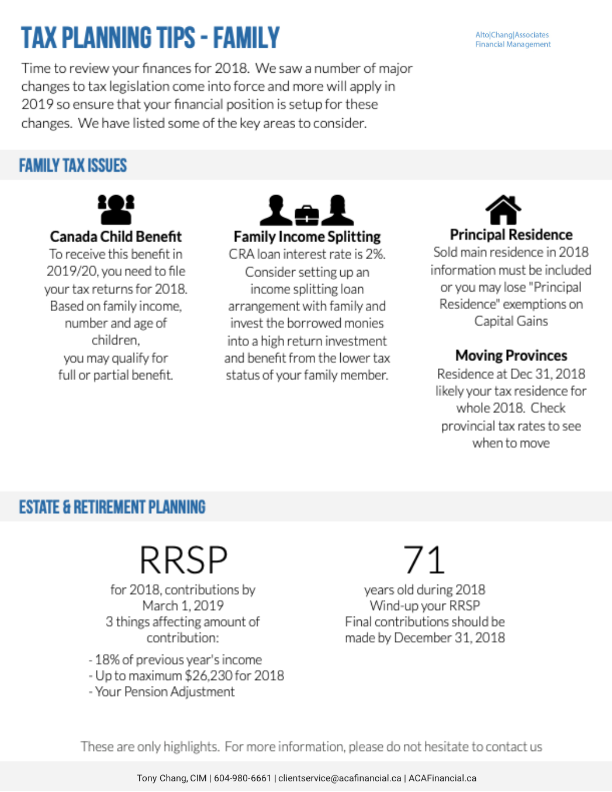 If you are moving to a new province, it’s worth noting that your residence at December 31, 2018 is likely to be the one that your taxes are due to for the whole of the 2018 year. Therefore, if your move is to a province with higher taxes, putting your move off until 2019 may therefore make sense, and vice versa if you are moving to a lower tax province. If you are able, it’s worth contributing the full $5,500 to your TFSA for 2018. You can also contribute more (up to $57,500) if you are 27 or older and haven’t made any previous TFSA contributions. The new passive investment income rules apply to tax years from 2018 and you therefore need to plan ahead if the rules affect you. 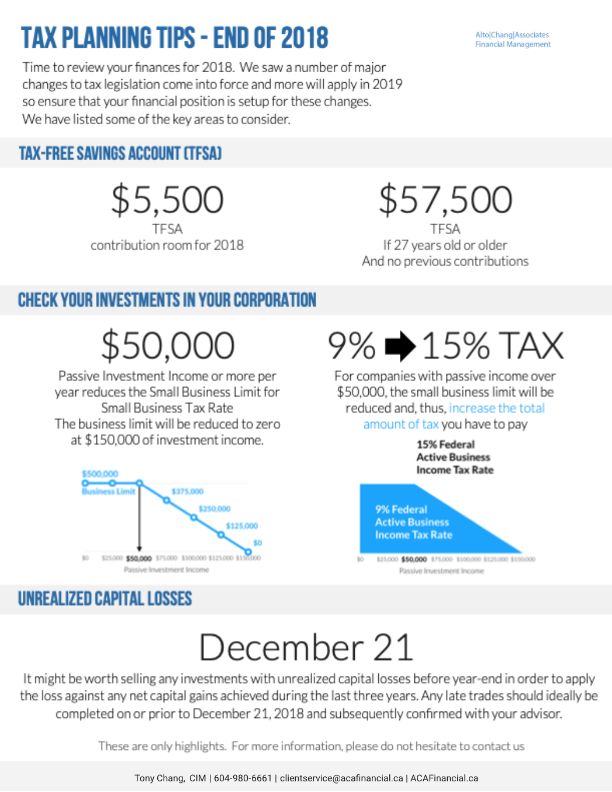 They state that the small business deduction is reduced for companies which are affected with between $50,000 and $150,000 of investment income, therefore the small business deduction has been stopped completely for corporations which earn passive investment income of more than $150,000. It might be worth doing this before year-end in order to apply the loss against any net capital gains achieved during the last three years. Any late trades should ideally be completed on or prior to December 21, 2018 and subsequently confirmed with your broker. Conversely, if you have investments with unrealized capital gains which are not able to be offset with capital losses, it may be worth selling them after 2018 in order to be taxed on the income the following year. Remember that deducting your RRSP contribution reduces your after-tax cost of making said contribution. You should wind-up your RRSP if you reached the age of 71 during 2018 and your final contributions should be made by December 31, 2018. If you pay your final 2018 personal tax instalment by December 15, 2018, you won’t pay interest or penalty charges. Similarly, if you are behind on these instalments, you should try to make “catch-up” payments by that date. 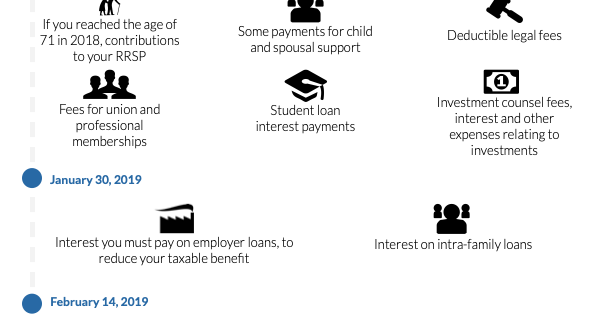 You can also offset part or all of the non-deductible interest that you would have been assessed if you make early or additional instalment payments. The deadline is December 31, 2018 for making a tax-payer relief request related to the 2008 tax year. The taxable benefit applied to company cars is comprised of two parts – a stand-by charge and an operating-cost benefit. If you drive a company car, it’s worth considering how to potentially minimize both of these elements. 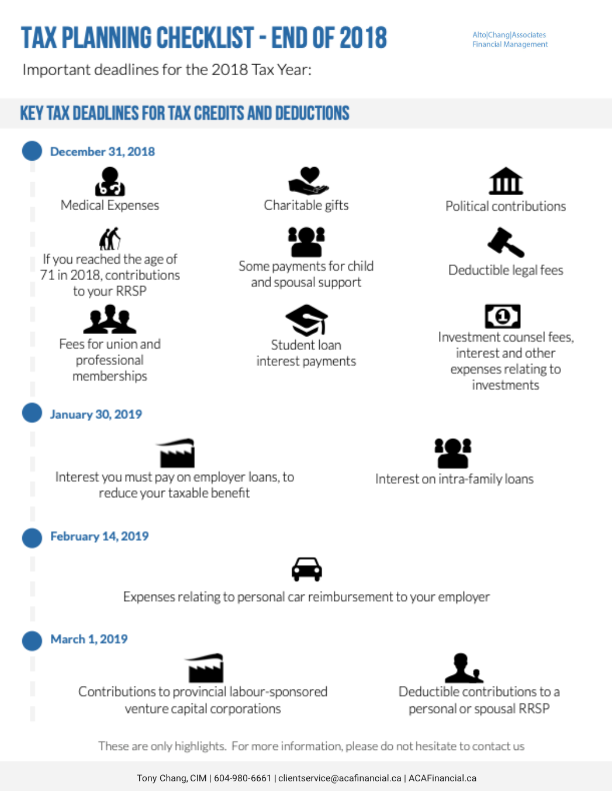 The taxable benefit for operating costs is $0.26 per km of personal use, therefore you should make sure that you reimburse your employer where relevant, by the deadline of February 14, 2019. Contact us if you have any questions, we can help. 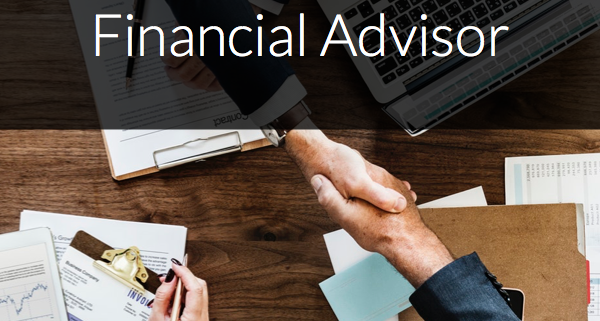 Working with a professional to help you to make sense of your finances can be a wise move, but for this relationship to work effectively it is important that you understand what to expect from your financial advisor. What can your financial advisor help you with? Defining your financial goals and creating a step by step plan or strategy to achieve them. Planning for the future, including for retirement, future education or housing needs. Choosing the mix of investments and assets that suit your goals, lifestyle, time horizon and appetite for risk. Building a solid estate for your family to inherit in the future. Choosing the most tax-efficient methods of saving and investing. What should your financial advisor inform you of? The range of services that they offer and how much and by which method you will compensate them. Your mutual responsibilities and obligations towards each other. What the planning process will look like and the documents that they will provide you with. What will your financial advisor need from you or need to ask you about? What your financial goals are. What your personal circumstances – such as your marital status, any dependents, your job, earnings and tax situation. Any investments or assets that you currently have – such as registered accounts, workplace pensions, property etc. Your appetite for risk and investment preferences. Information on your income and also your outgoings, including debts such as mortgages, loans or credit cards. Whether or not you have a will, and its contents. Your estate and inheritance planning situation. If you’re looking to achieve your financial goals, talk to us. We can help.